Summary (Goodreads): When Charlotte police discover the body of a teenage girl along a desolate stretch of two-lane highway, Temperance Brennan fears the worst. The girl’s body shows signs of foul play. Inside her purse police find the ID card of a prominent local businessman, John-Henry Story, who died in a horrific flea market fire months earlier. Was the girl an illegal immigrant turning tricks? Was she murdered? The medical examiner has also asked Tempe to examine a bundle of Peruvian dog mummies confiscated by U.S. Customs. A Desert Storm veteran named Dominick Rockett stands accused of smuggling the objects into the country. Could there be some connection between the trafficking of antiquities and the trafficking of humans? As the case deepens, Tempe must also grapple with personal turmoil. Her daughter Katy, grieving the death of her boyfriend in Afghanistan, impulsively enlists in the Army. Meanwhile, Katy’s father Pete is frustrated by Tempe’s reluctance to finalize their divorce. As pressure mounts from all corners, Tempe soon finds herself at the center of a conspiracy that extends all the way from South America, to Afghanistan, and right to the center of Charlotte. I have to admit I didn’t enjoy books 14 & 15 in the Temperance Brennan series as much as I had enjoyed previous ones. 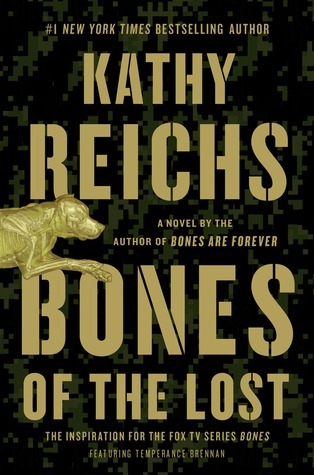 Bones of the Lost blew both it’s predecessors away, and Kathy Reichs is definitely back in the game and better than ever. Bones of the Lost gives an intriguing, twisty-turny plot that just when you think you’ve got it all figured out – BAM! – your theory just got blown out of the water. The answers to the many questions that the case of the dead young girl and the case of the mummified dogs raise are far from simple. It’s one of Temperance’s most interesting and far-flung cases. The two main cases of the book are the discovery of three mummified dogs from Peru that Tempe must examine to ensure they are indeed dogs, and the discovery of the body of a teenage girl who Detective Sliddell immediately assumes is an illegal immigrant worked as a prostitute. Well, he’s part right, although she wasn’t aware of being in the US illegally, as far as we know. The details we discover about the girl slowly but steadily bring her story to life. And while some biggish pieces are missing right until the end, hers is an interesting story. Kathy Reichs has a way of explaining all the forensic details in a way that won’t make you feel stupid if you aren’t a science buff, but doesn’t feel dumbed down if you are. It’s truly fascinating to see how somebody can actually be identified by just their bones, or a single tooth in some cases. Her way of ensuring that the autopsies Tempe must perform in Afghanistan are still respectful to the religion of the men being examined is very well done, and she is capable of making Tempe so very human even through a process that is less than savoury. As much as I would have liked to see Andy (Ryan) in the book a bit more, when we find out why he has been so MIA it’s quite a poignant moment between the two. It’s a fleeting moment but ties into Tempe’s understandable worries about Katy being in Afghanistan. It’s hard to say a lot without spoiling the book, but it certainly lessened but also added to Tempe’s worries as well. I really enjoyed this Temperance Brennan novel – I especially like my mystery/crime novels when I can’t figure out who is the bad guy (or when we know who the bad gu yis, it’s just working out how to catch them.) And I definitely didn’t see who the bad guy was in the one.